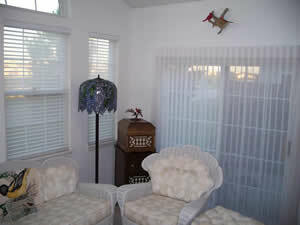 We have the equipment and expertise to clean all types of custom blinds and shades. 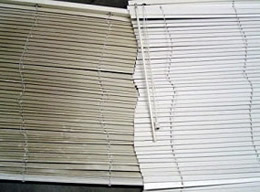 While ultrasonic cleaning does an excellent job on many types of blinds and shades, it isn't the safest or best method for other types of shades. 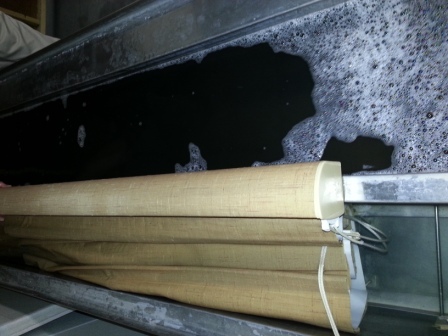 For fabric shades such as Luminettes, Silhouettes or honeycomb shades and many commercial roman shades, an ultrasonic cleaning provides a safe and effective deep cleaning method. Some specialty fabric shades or types of room darkening shades are cleaned using a dry cleaning solvent if cleaning with wet cleaning or ultrasonic cleaning is not appropriate. 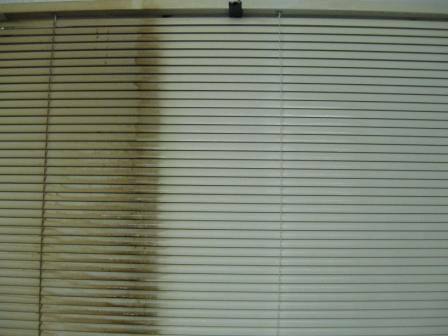 If fabric blinds or shades are cleaned in your home or facility, an injection/extraction cleaning method ("On-Site Method") may be used. 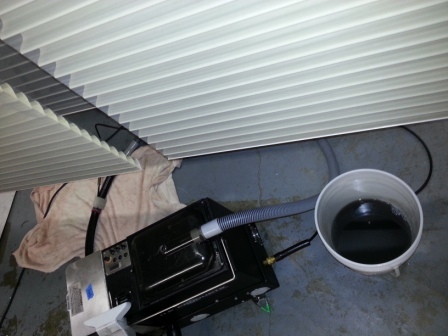 We have several ultrasonic tanks as well as several machines for injection/extraction cleaning operated by experienced blind cleaners (who are Certified Fabricare Specialists). Mini blinds, faux woods and other venetian blinds are cleaned ultrasonically either in our shop or on site (larger commercial jobs) to achieve a thorough cleaning that is impossible to achieve with any other method. As the cleaning action of the ultrasonics reaches EVERY surface of the blind including the cords, ladders and mechanics as well as both sides of every slat. No other method as effectively and as efficiently removes and traps all the built up grime, allergens and other undesirable dirt from the blinds in the cleaning solution. 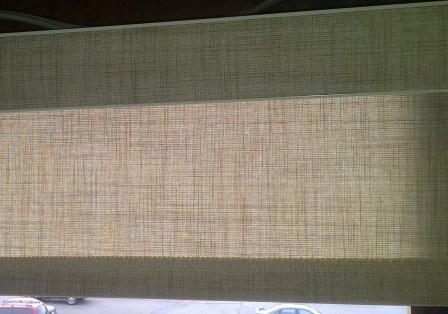 Rinsed blinds are left static free. If extra attention is needed to remove built-up grime, the blind may spend a few minutes on our wash wall to loosen up the heavy soils before one of our ultrasonic blind cleaners finishes the job. 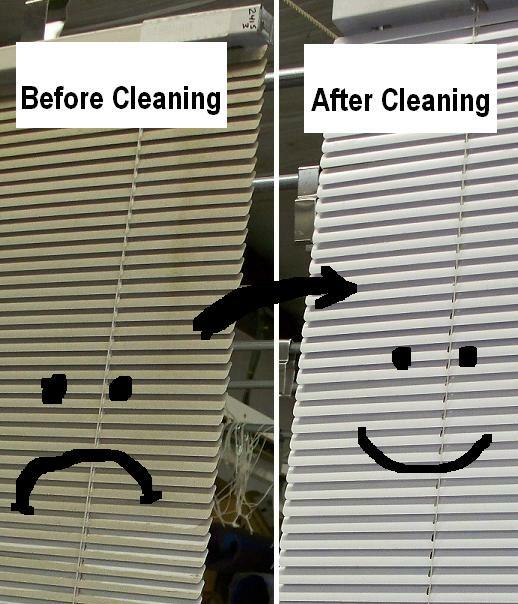 Though we don't recommend waiting 10-15 years to have your blinds cleaned - it's surprising how much their appearance may be improved. While we can't reverse the damage of the sun (oxidized or discolored finished, etc.) 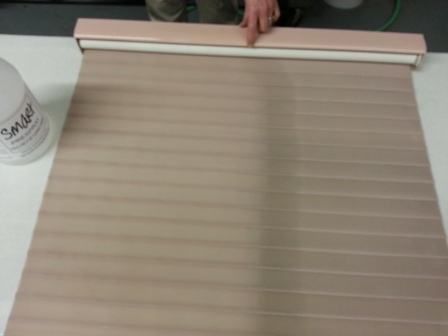 or remove all stains, cleaning custom blinds extends their life significantly. Removing the grime from these "on window air filters" also improve the air quality and provides a much healthier environment. Here's an example of what we mean by "healthier". The white vertical blinds being cleaned on site in a local dentist's office had been ultrasonically cleaned by our company previously. 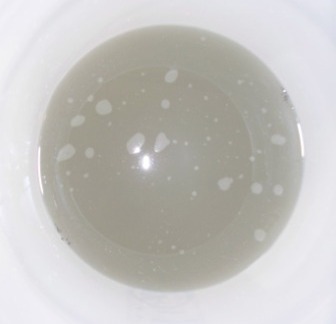 Look at the "stuff" that was in the bucket after we cleaned them on-site a few years later on another service visit. Every time ones blinds or shades are moved or disturbed, some of their dirt load gets redistributed into the air - that's why allergy sensitive clients love our services. 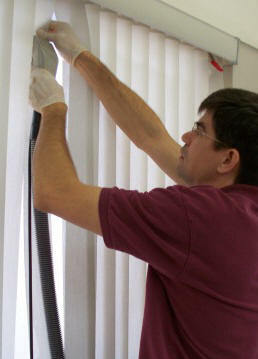 Prices for blind cleaning depend upon the type and size of the blind. Shop prices range from $12 per mini blind (under 4 x 6 ft.) to full service take down, cleaning and re-hanging of a similar sized Silhouette for $32. If you know what type of blind (faux wood, roman, honeycomb etc.) and its width (in feet) we can give you a rough estimate over the phone. Depending upon where you live (and the number of shades or blinds you have), dropping them off at the shop could save you $8-$10 per blind. Cleaning is a cost effective way to protect you investment in custom blinds as it typically costs only 5-20% of the replacement cost for the blinds or shade. If you have smaller inexpensive vinyl blinds or "cut to measure" blinds, the cost of cleaning or repairs vs. replacement often favors the replacement option; however, feel free to call us or drop by if you would like us to assess things for you. Similarly older fabric blinds we may only clean "without liability" if we believe they are not good candidates for a deep cleaning and yet you decide to try it anyhow in order get a few more years out of them. Budget Blinds & products sold by other franchises or retails like JC Penny's, Eddie Z's etc. Silhouettes that were cleaned for the first time after 9 years of dust, candle soot and accumulated soils. The Bon Soir Silhouettes at the right were dry cleaned and you can clearly see the black soot in the solution afterwards. Mini Blind Before-and-After Crop Shot. 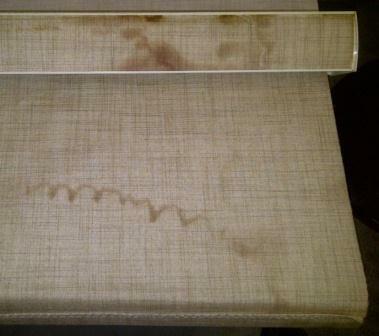 Before and after example of a water and dirt stained shade.